Linear Thermal Expansion is used to determine the rate at which a material expands as a function of temperature. This test can be used for design purposes and to determine if failure by thermal stress may occur. Understanding the relative expansion/contraction characteristics of two materials in contact can be important for application success. In a TMA, the specimen is placed in the holder at room temperature. The height is measured by the probe. The furnace is raised and the temperature is brought to 20 degrees below the lowest temperature of interest. The specimen is heated at a specified rate, often ten degrees a minute, over the desired temperature range. A graph is produced. Alternatively, a dilatometer can be used. 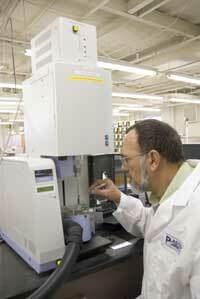 The specimen is placed in the Dilatometer at room temperature, and the height gauge is positioned and zeroed. 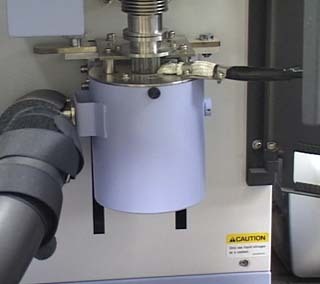 The apparatus is placed in a temperature bath and the movement of the sample is measured from -30° C +30° C.
For the TMA, the test specimen should be between 2 and 10 mm. in length and shall not exceed 10 mm in lateral dimension. The specimen must be flat on both ends. For the dilatometer, the test sample should be approximately 12.7mm (0.5") wide x 75mm (3") long. The coefficient of linear thermal expansion is calculated between the desired temperature ranges.